There are at least two major works on the long and varied history of British medal production and these include Royal Commemorative Medals 1837-1977 written by Andrew Whittlestone and Michael Ewing as well as the three-volume set titled British Historical Medals 1760-1960 by Laurence Brown. Taken together, they are not only fascinating reading, but they may be used to catalog individual medals in this long series. One medal contained in both works is known as BHM-4394 WE-7826 and it is a silver medal that commemorated the 1939 Royal Visit to Canada. The 1931 Statute of Westminster had fundamentally changed the relationship between Great Britain and its Dominions of Australia, Canada, New Zealand and South Africa and created a distinct Canadian Crown as well as making an allowance for Canada to form and follow its own foreign policy. The European tensions of the 1930s and looming conflict with Nazi Germany were very real to those in England, but were much more removed and abstract to those in the United States and Canada. Given the greater autonomy of Canada and the English realization that they would need substantial help in any conflict with Germany, the extended stay by King George VI and Queen Elizabeth was seen as a powerful way to strengthen Anglo-Canadian and Anglo-American relationships. For Canadians, the visit would be the first by a reigning British monarch and might support an independent Canadian identity as well Canadian stature in the international community. Canadian Prime Minister Mackenzie King accompanied King George VI and Queen Elizabeth through Canada as well as the United States and essentially presented the King and Queen to President Franklin Roosevelt. The visit to the United States included stops in Washington, DC, Mount Vernon, the New York World’s Fair as well as the Roosevelt estate at Hyde Park. ​Meaningful help from the United States toward Great Britain would need to overcome this isolationist stance carried by much of the American population. The tour itself was conducted largely by train and went westward, starting from Quebec City, on the Canadian Pacific Railway followed by an eastward return trip on the Canadian National Railway. The maps (above right and above center) [1,2] show the entirety of the trip including points within the United States as well as points arrived at by car, light train or boat. 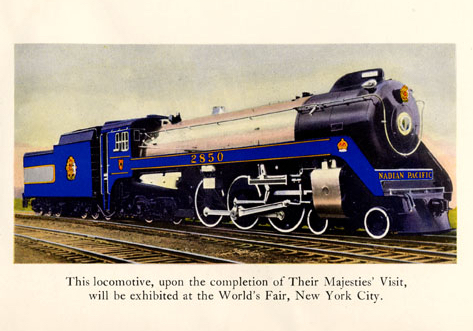 ​By the end of the tour, the Royal Train itself (right)  had achieved celebrity status and was displayed at the New York World’s Fair. 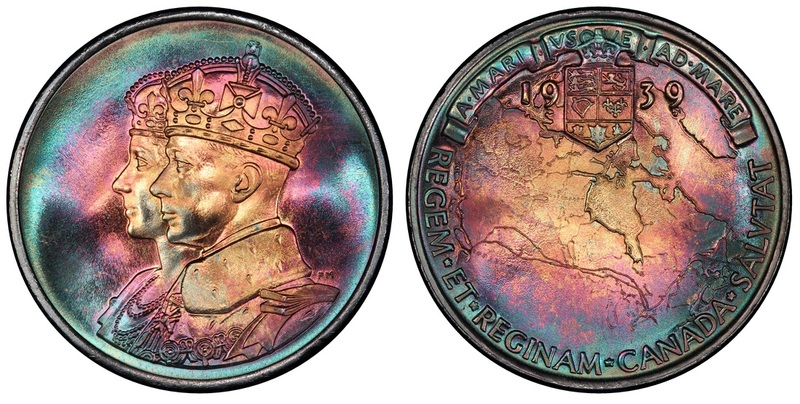 The resulting British historical medal features the conjoined busts of King George VI and Queen Elizabeth on the obverse with a blank field paired with a map of Canada, Latin legend and crowned shield dividing the date. The map of Canada has the route taken by train clearly plotted with arrows showing the westward and eastward lines. The Latin legend states “A-MARI-VSO-ME-AD-MARE REGEM ET REGINAM CANADA SALVTAT” which translates to “From sea to sea Canada greets the King and Queen”. Designed by P. Metcalfe and E. Hahn. These pieces are routinely available in 25mm and 38mm bronze issues as thousands were produced, sold and distributed, largely throughout Canada. The silver version is much more scarce and has a reported mintage of 260-pieces while a very few 77mm presentation pieces were also prepared. Presidential Coin & Antique Company. The Dan Hansen Collection held at the Suburban Washington-Baltimore Coin Convention, Baltimore, MD; November 8-10, 2002.